Some people got ‘em. Some people don’t. Freckles are a funny trait that are especially well defined with red heads, and with children. But what are they exactly? Freckles are clusters (or some groups) of pigment cells (special cells that contain colour). These cells overproduce melanin which is what causes the skin to be a darker colour in those spots. Freckles are typically a light brown or tan colour, they are flush against the skin and rather small. But because they often overlap each other, they appear to be bigger. They are more clearly seen in people with a fair complexion. Freckles are formed when they are exposed to sunlight, specifically UVB rays as they activate the melanin production, and causes these spots to darken. That’s why when you’re tanning or out in the sun too long, it might appear as though you suddenly have more freckles then you did before. Most of the time, freckles are known to appear on the face, and the upper cheeks and bridge of the nose, however it is common to have freckles on your arms, shoulders and upper back. And freckles don’t appear during infancy, but rather starting at childhood. Freckles are different for everyone. 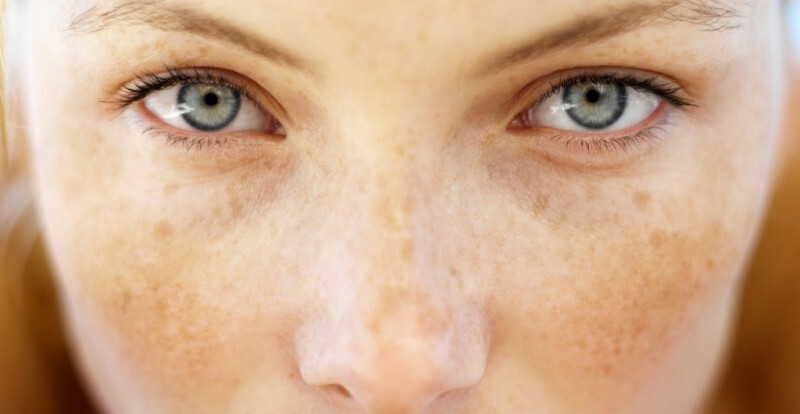 Some people’s freckles will seem to disappear during the winter (or darker) months, while they re-appear in the summer. Then there are other individuals whose freckles seem to stay status quo regardless of the amount of sunlight they receive. And of course, some people tend to lose the appearance of freckles the older they get; after puberty they might disappear or throughout the years, well into adulthood. Regardless, because freckles are activated by the sunlight, it is even more important for those with light complexions and with freckles to be extra cautious and wear sunscreen when out. There is one type of freckle called “ephelides” which are most often seen in individuals with fair skin. This type of freckle is light brown or red in colour and fades over time and reduced exposure to the sun. With the regular use of SPF on your skin, you can reduce this type of freckle from recurring, however if you stop wearing sunscreen and go out in the sun, your freckles will suddenly start to reappear. Sun spots (or liver spots as they are more commonly referred to) only form after many years of prolonged sun exposure, and are more common in older men and women. They appear to be large freckles, but in fact, they are not. If you have freckles, there’s nothing to be afraid of. Freckles are not a sign of disease or disorder. In fact, they are quite natural. As we’ve discussed, freckles are most often seen in folks with lighter skin and are a result of reduced melanin in the skin which means your skin is more vulnerable to UV rays. So if you have freckles, please be sure to protect your skin with proper sunscreen.